On Friday September 7th SAGE is hosting a webinar on how to do conversation analysis. 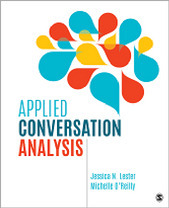 In this webinar, Jessica Lester and Michelle O’Reilly illustrate the value of analyzing conversations in applied settings. Drawing upon conversation analysis, they highlight how to use this particular approach to design and carry out studies in the real world. This presentation will be followed by a question and answer session. The hour long webinar will start at 9 a.m. PST. To register for this free webinar click HERE.